Do you need eCheck services due to mail service disruption from recent disasters like Hurricane Irma and Harvey? Or do you just want to boost cash flow and get paid faster? Online payment solutions are quick, easy, and relatively cheap to implement. Using a third party solution vs bank can be cheaper and provides flexibility to change financial services partners without creating customer friction. Why use a hosted pay page to accept eChecks? A payment gateway hosted pay page enables customers to passively pay bills online 24/7 via a secure web page. Payment types may include credit cards, Paypal, ACH (echeck), wire and other methods. Because it’s hosted by a 3rd party PCI level 1 certified service provider, PCI Compliance burden is reduced for merchants that want to accept more than eChecks. A hosted pay page empowers customers to make secure payments online. Direct customers to 3rd party payment gateway custom URL- no change to business web site needed. Just email or text the link. Link from business web site to 3rd party payment gateway custom URL by updating. Html and pay now graphical button available. 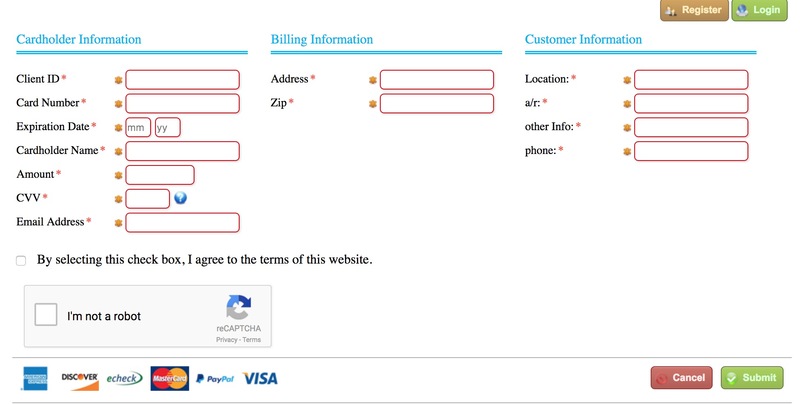 Embed the secure payment object on business web site via iframe html. Customers never leave merchant web site, and even though payment is accepted on the 3rd party web site, an SSL certificate is strongly recommended. There are other ways to collect ACH and eCheck payments remotely, including our alternative service that enables businesses to push out payment requests via via email or text. This method is proven to increase loyalty as well as reduce time to collect payment and is available for an additional fee. It’s available both integrated or standalone. The two key methods to process eChecks are FTP direct to the business bank and 3rd party check processor (Web Payments). With FTP, money is in the bank account when the batch is delivered. With traditional eCheck services money is delivered typically in 2-3 business days. In either case, a payment gateway or technology solution secures the data transmission and facilitates compliance with eCheck processing rules. Vendor selection checklist- which do you need and which would be nice? If you’re just accepting eChecks, you’ll be surprised at just how cheap the service is. If also accepting credit cards, the hosted payment solution selected directly impacts the cost of credit card processing. For example, our solution with Smart Rate Selector automatically optimizes the transaction to qualify for the lowest rate. Compliance with rules are complex and few payment gateways have a solution to comply with every situation. With the right implementation, the cost of card not present transactions are often exactly the same as card present, and can be lower than if employees key enter transactions into a virtual terminal. This entry was posted in online payments and tagged Accept Payments Online, ach, echeck, hosted pay page, online payments, payment gateway by Christine Speedy. Bookmark the permalink. I really found very interesting about these ach echeck solution because you have good content and unique information on merchant services.